We've had Doctor Who Live and now it's the turn of another iconic character who's been around even longer than the Doctor - Batman! The story is all-new and written exclusively for the show. 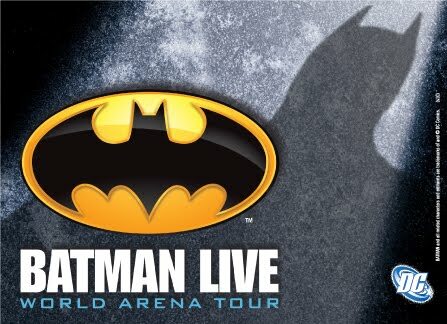 Batman Live will feature exciting stunts, acrobatic acts and illusions. Gotham City, Wayne Manor, the Batcave and Arkham Asylum will be brought to life on stage and Batman and Robin will fight old foes such as the Joker, The Riddler, Catwoman, The Penguin and Two-Face. Starting at the Manchester Evening News Arena on 20 July, the show will also appear in Newcastle, Glasgow, Sheffield, Birmingham, London, Liverpool, Nottingham, Dublin and Belfast. 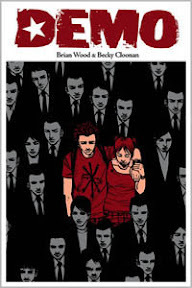 Continuing Panel Borders month-long look at unusual takes on superheroes, Alex Fitch talks to artist Becky Cloonan about her work, focusing on the series Demo, written by Brian Wood which is a more down to earth look at the problems teenagers with superpowers might face in the real world. Alex and Becky also talk about her horror collaboration project Pixu with Gabriel Ba, Fabio Moon and Vasilis Lolos and her forays into manga with East Coast Rising. Three television character figures from The Goons founder Michael Bentine’s 1954 BBC children’s series The Bumblies are to be sold at Bonhams, Knightsbridge, as part of its Fine Dolls, Teddy Bears, Toys and Lead Soldiers sale on 16th November 2010. Designed by Norman Tooth, Bumbly One, Bumbly Two and Bumbly Three are some of the rarest of all the British hollowcast TV characters manufactured in the 1950s and were not widely distributed. They have attracted a pre-sale estimate of £1,000 – 1,500. Michael Bentine devised and wrote the 13-part children's series about three friendly little aliens from outer space, cheerful ambassadors from the Planet Bumble, who landed in their flying saucer in the garden of an absent-minded professor of astronomy, with the express purpose of getting to know the children of Earth, and learning how to play their games. The show was a precursor to his other creations such as Potty Time and his part in The Goon Show. Two episodes of The Bumblies feature on the 2004 Michael Bentine's Potty Time DVD release. The sale also includes the well-known film and television characters such as a Mickey Mouse bagatelle board; a Forbidden Planet spaceship; hollowcast Andy Pandy (estimate £200 – 300), The Flower Pot Men (estimate £300 – 400); and Rag, Tag and Bobtail figures (estimate £200 – 300). 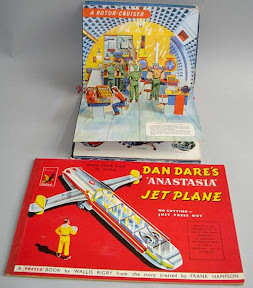 Comics-related items include a Japanese Batman tin toy, a Dan Dare Walkie Talkie set and what is probably a very rare Dare 'Anastasia' Jet Plane press out make your own model book and Dan Dare pop-up book. Produced by Juvenile Production Ltd., the book has three page story of one of Dan Dare's Adventure in Anastasia and four pages of press-out card sections for constructing the spacecraft. Other important lots include kewpie dolls designed by acclaimed artist Rosie O'Neill; a composition doll of Tsar Nicholas II, the last Emperor of Russia (estimate £400 – 600) dressed in World War I khaki uniform; a rare Rohmer type doll and trousseau (estimate £1,000 – 1,500); several model trains including a 6 inch gauge live steam model of a 2-2-2 South Eastern Railway locomotive (estimate £4,000 – 6,000), which was built by George Wilcox of Darlaston in 1895; and a W. Dunsmore & Son Ltd. biscuit tin motor car (estimate £4,000 – 5,000). This Remembrance Weekend the Imperial War Museum in London is opening a new permanent exhibition entitled Extraordinary Heroes which celebrates the courage of the many men and women who have received the two highest British and Commonwealth medals of honour, the Victoria Cross and the George Cross, throughout the years. 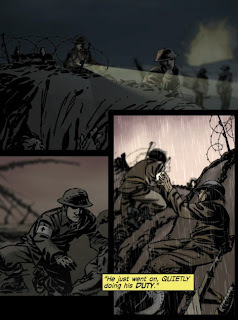 As part of this new exhibition, the museum has commissioned digital comics covering the actions of eight of these individuals - one double VC winner, four VC winners and three GC winners, from pilots to policemen, medics to spies. When we think of digital comics we tend to think of comic panels customised for devices like the iPad and small mobile phone sized screens, but the Imperial War Museum will be screening their especially created comics on screens that are two metres long by one metre high. These historically accurate comic biographies were created specifically for this exhibition by ISO Designs of Glasgow and for which the company used the talents of Commando writer Ferg Handley and The Boys artists John McCrea and Keith Burns along with colourist Andrew Elder. Jeremy Briggs spoke to Ferg and John about their work for the Imperial War Museum and you can read about it here on the downthetubes main site. • There are more details of the Extraordinary Heroes exhibition at the Imperial War Museum's Extraordinary Heroes website. • You can donate to the Poppy appeal all year round via the Royal British Legion and Poppy Scotland websites. The Walking Dead, shown in the UK on FX TV and based on the hit comic book series created by Robert Kirkman and drawn by British creator Charlie Adlard, has been renewed by US producer AMC after just two episodes. 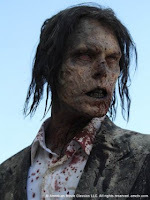 Sold to 120 countries worldwide, the show has been a huge ratings success, with World Screen reporting that the debut episode of the zombie-themed series was the highest rated show in its time slot on pay TV in the UK. It was also the highest rated premiere for a new show on FX in five years. FX UK notched up 659,000 viewers for the show, after adding up all of the airings by Sunday. Based on the pattern of previous series, distributor Fox International Channels expects the show to get to one million once delayed viewing is added in. The multi-award winning book published by Image in the US has been brought to life by American production company AMC -- the US channel that gave us the Emmy award-winning dramas Mad Men and Breaking Bad. For many years, FA magazine - originally published as Fantasy Advertiser - was arguably the best comics fanzine in Britain, but 20 years ago publication sadly ceased. We're delighted to report that it’s back, in sparkling online form, run by old editor Martin Skidmore. "We hope it will be a stimulating, varied and challenging site about comics," says Martin. "We have lots of the same old writers and lots of new ones, including some top critics of other art forms." "I am ambitious about this site," he adds. "I want it to be great, and to advance the form of comics criticism. The launch content is a decent start, I like to think, but I am aiming higher. There are a few world-rated critics of music and movies, for instance, who have promised contributions, and I am hoping they will bring a fresh perspective and approach." Contributors include writers included in ‘best music writing in the world’ books, or who have been invited to vote in Sight & Sound’s 10-yearly polls as one of the world’s leading movie critics. Initial contributors include Jonathan Bogart, Peter Campbell, Nigel Fletcher, Comics Journal writer Andrew Littlefield, Ian Moore (author of the Inuit Panda blog), Will Morgan (co-owner of London's 30th Century Comics shop) and, of course, Martin himself, who edited FA way back in the 1980s. Martin also edited at Trident Comics, which included work by Grant Morrison, Neil Gaiman, Mark Millar, Eddie Campbell and others. He's been a comic fan since being reintroduced to them (especially Steve Gerber's work) as a teenager. These days he is mostly enthusiastic about manga and old comic strips, but still follows some of those creators he briefly worked with. FA will feature reviews, features, interviews, news commentary, a new regular comic by ace British talent Martin Hand, and more. Content will be added on a daily basis. "We want more good contributors, so go to the site and email us if you might be interested," says Martin.